Critique groups can be wonderful. They can offer accountability, professionalism, and take our writing to an entirely new level. But, like most, things, critique groups also have a dark side. They can become a crutch that prevents genuine growth. Depending on the problems, critique groups can create bad writing habits and even deform a WIP so badly it will lose any chance at resonating with readers, thus being successful. The key to avoiding problems is to be educated. Not all critique groups are worth our time. Some critique groups might have limitations that can be mitigated with a simple adjustment in our approach. Many of you have attended a traditional critique group. This is the “read a handful of printed pages or read so many pages aloud” groups. Traditional critique groups have some strengths. First and foremost, they can clean up a new writer’s prose. When we turned in that high school paper with 60 glorious metaphors on page one, we got an A. Why? Because our teacher’s goal was to teach us how to use a metaphor properly. Her job was not to train us for commercial publication. In a good traditional critique group we learn that POV does not mean “Prisoners of Vietnam.” We learn to spot passive voice and “was clusters” and why modifiers aren’t always extra-nifty. We will hopefully learn self-discipline in that we need to attend regularly and contribute. We can also forge friendships and a support network. Traditional critique groups lack perspective. Once a week reading fifteen pages only cleans up shoddy prose. Traditional critique groups are looking at a work the size of a skyscraper with a magnifying glass. They lack the perceptual distance to see structural flaws. A novel can have perfect prose page to page and yet have catastrophic faults. In fact, I would venture to say that most writers are not rejected due to prose, but rather, they meet the slush pile because of tragic errors in structure. Traditional critique groups can tell us nothing about turning points or whether a scene fits properly. They lack the context to be able to discern if our hero has progressed sufficiently along his character arc by the mid-point of Act 2. They have zero ability to properly critique pacing, since pacing can only be judged in larger context. So, my advice is to get a beta reader that you trust. Critique groups cannot do what only beta readers can. ***A beta reader is a regular person who likes to read our genre and will tell us about the story from a reader’s perspective. Traditional critique groups can also hurt us in the following ways. Traditional groups can get us in a habit of over-explaining. Well, duh, of course they’re lost. They’ve missed the last three weeks and haven’t been keeping up with the story. So learn to resist the urge to over-explain in your prose. Our job is to write a great novel…not 600 individual sections our critique groups can follow. Traditional critique groups are notorious for the Book-by-Committee. Not everyone’s opinion is equally valid. If you are like me and lean to the people-pleasing side, you can get in a nasty habit of trying to please your critique group at the expense of the big picture. Learn discernment and how to stick to your guns, or you will end up with a Book-by-Committee, also known as Franken-novel. One great way to know good advice is to READ craft books. Hooked by Les Edgerton, Save the Cat by Blake Snyder, Story Engineering by Larry Brooks, and Plot & Structure by James Scott Bell are a great start. In fact, ANYTHING written by Edgerton or James Scott Bell, just buy it and read it. You can thank me later 😉 . That way, when someone offers suggestions, you will know whether or not that advice is supported by leading teachers in the industry. They can get us in a habit of perfectionism. The world does not reward perfect novels, it rewards finished novels. I still run into writers who have been working on “perfecting” the same novel for the past ten years. As professionals, we need to learn to LET GO. Either the project was a learning curve and it needs to be scrapped and parted out, or it needs to be handed a lunch box and sent off to play with the big novels via query or publication. Scrap it, part it, shop it or ship it but MOVE ON. There are writers I know who have been working on the same book for four, five, even SIX years. I see them at conferences dying to land an agent and get that three-book deal. WHY? New York isn’t going to give them another 12-18 YEARS to turn in manuscripts. The hard reality is that, if we hope to make a living at this writing thing, we need to learn to write solid and we need to learn to finish…quickly. Traditional critique groups can offer a false sense of security. We must always be looking for ways to have our work critiqued by professionals who are willing to be blunt and who possess the skill set to see our errors. Don’t join a writing critique group simply because they say they are a writing critique group. Look at their credentials. How many successfully published authors has the group produced? How many people in the group are career writers, authors, or editors? Gathering together because we love writing is always a great idea, but if the group is solely comprised of hopeful unpubbed writers, the critique will be limited. Limited is fine, so long as we make sure to reach beyond that group for additional critique. We must make sure our work is being reviewed by people who will be honest about any problems. Meeting once a week to sing kumbayah is not the best preparation for this brutal career. Once our book is for sale, we are open to the big bad real world of people with nothing better to do than skewer us publicly on-line in a blistering review. If your goal is to write great novels, make sure any group you join is producing successful novelists. I spent way too many years in a critique group that produced all kinds of articles and NF, but no one had published a successful novel. Then I wondered why the critique was…eh. When I left that group for the DFW Writers Workshop, my world tilted on its axis because DFWWW is AWESOME and is known for producing professionals in all genres. In fact, I wouldn’t be here without them. I also STRONGLY recommend joining RWA (Romance Writers of America) and find an RWA chapter nearby even if you don’t write romance. RWA is by FAR the most professional group of authors any of us can connect with. They are at the leading edge of the industry and these folks will totally send in the flying monkeys if you don’t get back to writing. By the way, if you want to get more out of your critique group, I have a class this Saturday (details below) that can make sure your larger structure is sound. This class can do what your critique group can’t and it will help you spend your time more wisely. So what do you guys think? Have you had problems? Does your critique group seem to only run you in circles? Have you fallen for the perfectionism thing? Or am I off-base? What are your solutions? Ideas? Also, for more help on how to use characters to ratchet anxiety to the nerve-shreding level, I am offering my Understanding the Antagonist Class on April 18th and YES, it is recorded in case you miss or need to listen again because this class is jammed with information. Do You Have a Psychic Vampire Critique Partner? WHAT do you MEAN I am head-hopping? THAT is my VOICE. You are ruining my ART! Several months ago, in my Enemies of the Art series, we discussed Psychic Vampires. Psychic Vampires are all around us, and likely, we will never be rid of them. PVs are most likely to show up at a number of critical junctures. They sense the energy shift, and since that energy is no longer all about them, they will fight tooth-and-nail to bring balance to The Force (of Manipulation). While many of my posts are directed toward writers, most people have these same issues. If we don’t learn how to guard against and handle PVs, we will always be their victims. Psychic Vampires will always feel renewed and refreshed, namely because they just sucked the life out of their victims (us). Psychic Vampires abound in the arts, and they’re also prevalent in many writing groups. They are vamps dressed in writer clothing. Often they are so self-absorbed they can’t even see the reality of what they are. This is why confronting PVs is almost always fruitless and will simply lead to conflict that only further feeds them at our expense. Our best option is to be able to spot them, then ignore them or RUN. I wish I could give all of you a nice, easy website to find healthy, professional critique partners, but unfortunately those don’t exist. We will have to trust, then use trial and error, then set tough boundaries. Some CPs will make it, but likely most will not. Too many writers get into this business for the wrong reasons. They really aren’t interested in the life of a professional and just enjoy “playing author.” Writing is for attention and ego-stroking. Their goals are about THEM and this means anyone on board with them will go the wrong direction. They will keep steering the ship the wrong way…toward the rocks. What do you mean too many flashbacks? YOU ARE SO MEAAAANNNN! If you have a critique partner who refuses to listen to honest feedback. If she is touchy and oversensitive? Move on. You won’t grow. You’ll spend too much time propping up an ego that can never get enough propping up. The PV will be a continual vortex of need and if you don’t jump ship while you can? Expect to crash on the rocks with them. This writer won’t make it unless she changes, and if you’re enabling her to be a PVCP, why should she? I cannot recommend attending writing conferences enough. Yes, even WANACon counts. We are having another WANACon the first weekend of October and deliver top tier NYTBSA talent right to you AT HOME. Right now we are having a special, the ENTIRE conference and recordings for $119 (which will expire soon). Just like a writing conference only no travel and at YOUR convenience. We can arrange a TSA feel-up, but they work for tips :D.
The reason we need to choose friends wisely and surround ourselves with professionals, is that these writers have invested cold hard cash into getting better. When we forge relationships with writers who are professional or stronger, we grow. Water will always find its level, so make sure you’re rising, not sinking. Habits are contagious. This is one of the reasons I cannot recommend joining an RWA chapter enough (even if you don’t write romance). RWA is full of professionals who work their tails off and understand craft and the business. As iron sharpens iron, so one man sharpens the other. Refuse to be in a place that dulls your creative edges. I’ve been in critique relationships where the other person never learned to think for themselves. Why bother reading Story Engineering, The Writer’s Journey, Hooked, Save the Cat or Plot & Structure when we can get Kristen to so all our thinking/plotting for us? I recall two members of a critique group who attended every week with their crappy writing to be critiqued. Instead of learning, they just barfed down junk on a page and let the group “fix” it. Odd thing was, after over a year of enduring the world’s worst writing, nothing changed. When these individuals self-published? NONE of the writing had changed. This ticked me off. How many hours had we dedicated to helping, when the writer had zero intention of listening? The critique wasn’t a place to grow; rather, it was a captive audience who had to listen to their dreadful “story” vomit. Most of us are short on time. We often have day jobs, kids, chores, bills and we have to do social media and MOST IMPORTANTLY we need to be writing more books and better books. It’s easier to tread water if we aren’t dragging a PVCP anchor around our necks. 1. Is the writer touchy. Does she want every bit of feedback to be handed with a box of chocolates? 2. Does she attend regularly? Or does she always have an excuse of why she can’t be there—great-nephew’s birthday party, helping a friend’s garage sale, washing her hair? 3. Does the writer actually READ? Does she read fiction and LOVE storytelling? I’ve met writers who claimed they wanted to be NYTBSAs, but said things like, “Well, I just don’t like to/have time to read.” Reading is FUNDAMENTAL to what we do. A writer who doesn’t read is like a musician who doesn’t listen to music. TIME WASTER. 4. Does the person give back? Critique partners should be partners. I’ve had writers who took and took for months. They wanted me to plot, then re-plot, then they had a new and BETTER idea they needed “help” plotting. Never once did it occur to them, that we hadn’t talked about my book in months. 5. Does this person ever grow? Or do they keep making the same newbie errors over and over? If they are? They aren’t listening, so move on. This is a PVCP. RUN. What are your thoughts? Have you been the victim of a PVCP? What did you do? How did you handle it? What are your horror stories? How did you stake the PVCP? What might be some other ways to spot a PVCP? What might be some good resources for finding a good CP? I recommend trying WANATribe, join RWA or attend conferences. But, maybe you guys have some better suggestions! BTW, Image number two courtesy of best movie ever Army of Darkness. Since it was such a HUGE success and attendees loved it, I am rerunning the Your First Five Pages class SATURDAY EDITION. Use the WANA15 code for 15% off. Yes, editors REALLY can tell everything they need to know about your book in five pages or less. Here’s a peek into what we see and how to fix it. Not only will this information repair your first pages, it can help you understand deeper flaws in the rest of your manuscript. 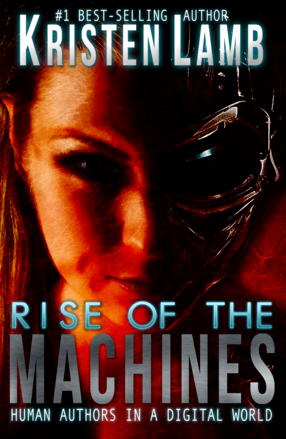 My new social media book, Rise of the Machines–Human Authors in a Digital World is NOW AVAILABLE. Only $6.99. WANACon, the writing conference of the future is COMING! We start with PajamaCon the evening of October 3rd and then October 4th and 5th we have some of the biggest names in publishing coming RIGHT TO YOU. If you REGISTER NOW, you get PajamaCon and BOTH DAYS OF THE CONFERENCE (and all recordings) for $119 (regularly $149). Sign up today, because this special won’t last and seats are limited. REGISTER HERE. I am like cerebral flypaper for cool anecdotes, but one that stood out to me was the story of the crabs in the bucket. When fishermen trap crabs, they just dump them in a bucket on the pier. No lid. Nothing to trap the crabs and keep them inside. Why? Because if any crab tries to climb out of the bucket and escape, the others will pull it back inside. Many of us, when we decide to become professional authors face “crabs in the bucket.” They often look a lot like family, friends and even fellow writers. They fear failure, so they fear our success. If we actually accomplish something remarkable, we prove that success is more choice than fate. We have to let go of the old to grab hold of the new, but that’s often the most terrifying thing we can do. The past might be destructive, stagnant or even toxic…but it’s familiar. When we decide to do something remarkable, we face the unknown. It’s easy to be lulled into the idea that the devil you know is better than the one you don’t. As artists we need to guard our emotions and our muse. Negativity, doom, gloom and drama can rob our energy, erode our (often) fragile confidence, and undermine success. Refuse to hang out with whiners, complainers and lazy people. Bad habits are contagious. No company is better than bad company. As a neophyte, one thing I didn’t understand was that just because a group meets and professes to be a “serious writing group,” doesn’t make it so. I can say I’m the Queen of England. Doesn’t make it truth. Many years ago, I joined my first writing group, but I was naive and didn’t know that Show, Don’t Tell applies to life as well as fiction. At first, I was just a member and a lot of people actively attended and participated. My skills grew exponentially. Then, gradually, most of the published authors stopped attending and attendance dropped off. It wasn’t at all uncommon for me to be the only one who showed up for the meeting. Most of the remaining members only attended when they wanted line-edit. They took but rarely gave (unless they wanted something). I failed to see the climate shift in this group and stuck it out. I thought that maybe, if I became president, I could resurrect the club. Instead, I fielded years of complaints, hate mail, and personal attacks, often from people who attended quarterly (we met bi-weekly). They didn’t want to help, but sure had a lot to gripe about. They didn’t like the day, or the time, or the location or that we only met once a week or that we couldn’t meet weekends or that we met both weekdays and weekends and why can’t we do this or that or both? The pettiness and stupidity was simply EPIC. I nearly lost my mind with the churlish politics of running a volunteer organization. Many of the members did nothing but criticize everything I did and everything I didn’t do. Yet, when I finally walked away and decided not to be a punching bag president another year? I was an @$$%^$# for that, too. Crabs are never happy and they LIKE being in the bucket. They can’t see they will soon be made into crab salad. Joining a writing group is one of the best things you can do as a new author, but please learn from my stupidity. If the group isn’t producing published writers? If people say they want to be professionals, but can’t bother showing up? If all they do is complain and backbite? If they never finish anything? I always recommend finding a Romance Writers of America chapter in your area (even if you don’t write romance). RWA is full of professionals who take their craft and jobs seriously. They can help hone your craft and be a system of growth and emotional support. You can also find peer support on WANATribe, #MyWANA or even the WANA Facebook page. We are who we hang around. If we hang around flaky amateurs who don’t keep their word, who consistently fail to honor their commitments, and who never finish anything? People who change their minds every other day what they want to do with their lives? People who whine more than work? We’re letting them drag us back in the bucket. Want to be successful? Professional? Hang around those people. Stalk them on Twitter. Comment on their blogs. Digital relationships are just as powerful. My closest friends (all PROS) I met on-line. I learned to be a professional by escaping the bucket, then looking to the pros. I read their books, their blogs and immersed myself in their energy. What about you? Facing some crabs in the bucket? Have you escaped the bucket? How did you do it? To prove it and show my love, for the month of June, everyone who leaves a comment I will put your name in a hat. If you comment and link back to my blog on your blog, you get your name in the hat twice. If you leave a comment, and link back to my blog, and mention my book We Are Not Alone in your blog…you get your name in the hat THREE times. What do you win? The unvarnished truth from yours truly. At the end of June I will pick a winner for the monthly prize. Good luck! For the past several weeks we have been exploring structure and why it is important. If you haven’t yet read the prior posts, I advise you do because each post builds on the previous lesson. All lessons are geared to making you guys master plotters. Write cleaner and faster. I know a lot of you are chomping at the bit right now to get writing. All in due time. Today we are going to talk genre and why it is important to pick one. Understanding what genre you are writing will help guide you when it comes to plotting your novel. How? Each genre has its own set of general rules and expectations. Think of this like stocking your cabinet with spices. If you like to cook Mexican food, then you will want to have a lot of cumin, chili powder and paprika on hand. Like cooking Italian food? Then basil and oregano are staple spices. In cooking we can break rules … but only to a certain point. We can add flavors of other cultures into our dish, but must be wary that if we deviate too far from expectations, or add too many competing flavors, we will have a culinary disaster. Writing is much the same. We must choose a genre, but then can feel free to add flavors of other genres into our work. Ten years ago, when I first got this brilliant idea to start writing fiction, I didn’t do any planning. I knew zip nada about the craft, and, frankly, was too stupid to know I was that dumb. To make matters worse, I tried to write a novel that everyone would love. It was a romantic-thriller-mystery-comedic-memoir that would appeal to all ages, both men and women and even their pets and houseplants. I am here to help you learn from my mistakes. I believe there are three kinds of writers. One type of writer is the Born Genre Author. This type of writer knows the genre he wants to write from day one. He is a born horror author or fantasy author, or whatever. This type does not start on a horror novel and then suddenly start thinking that YA is more his stride…or maybe sci-fi…or literary fiction. This author’s laser-focus is a tremendous asset, but tunnel-vision can get him in trouble. The greatest weakness I see with this type of writer is that they often don’t read outside their genre and so their work can lack that je ne sais quoi that makes their writing stand apart from others in their genre. Of course, this is easily remedied if this type of author can make a conscious effort to diversify. Another type of author is like I used to be (and still have to fight). Meet The Dabbler. We love everything and have a hard time making up our minds. We love all kinds of writing, but this lack of focus can hurt our platform and spread us too thinly to be effective. Dabblers also are bad about making the mistake of trying to write a book that is all genres and what they end up with is an unpalatable mess. On the flip-side, though. Dabblers who can finally choose a genre usually are very innovative creatures because they have the knack and ability to draw flavors of other genres into their writing. The trick is getting them to pay attention and focus long enough. Then there is the third kind of writer, The Profiteer. These writers are in the business for all the wrong reasons, and, because of that, usually never end up finishing, let alone publishing. They are writing for the money and fame and often are genre-hos. They keep a finger in the wind searching for what is currently hot. Vampires? Chick-lit? Whatever is flying off shelves, that is The Profiteer’s new love. Of course what this writer doesn’t understand is that by the time they finish the novel, land an agent and that book makes it to print, the trends will have changed. But most Profiteers fall by the wayside, so that’s all I will say about them. Just as nailing the log-line is vital for plotting, we also must be able to classify what genre our novel will be in. Now, understand that some genres are fairly close. Think Mexican Food and Tex Mex. An agent at a later date might, for business reasons, decide to slot a Women’s Fiction into Romance. Yet, you likely will NEVER see an agent slot a literary fiction as a thriller. They are too different. That is like trying to put enchiladas on the menu at a French restaurant. Part of why I stress picking a genre is that genres have rules and standards. For example, I had a student drop out of my Warrior Writer Boot Camp because I told her that her hero could not be the Big Boss Troublemaker (main antagonist) in her romance novel. I advised her that the hero could be an antagonistic force, but that she had to choose another person to be the BBT. Why? Because the genre of romance has rules, and guy and gal MUST come together at the end and live happily ever after. This cannot happen if the heroine defeats the hero. Great love stories generally do not involve the hero being beaten up by a girl. I didn’t make the rules, but I can help a writer understand those rules and thereby increase his/her chances of publication success. Understanding your genre will help immensely when it comes to plotting. It will also help you get an idea of the word count specific to that genre. I am going to attempt to give a very basic overview of the most popular genres. Please understand that all of these break down into subcategories, but I have provided links to help you learn more so this blog wasn’t 10,000 words long. Mystery—often begins with the crime as the inciting incident (murder, theft, etc. ), and the plot involves the protagonist uncovering the party responsible by the end. The crime has already happened and thus your goal in plotting is to drive toward the Big Boss Battle—the unveiling of the real culprit. Mysteries have a lot more leeway to develop characters simply because, if you choose, they can be slower in pacing because the crime has already happened. Mysteries run roughly 75-100,000 words. Mysteries on the cozy side that are often in a series commonly are shorter. 60,000-ish. I’d recommend that you consult the Mystery Writers of America of more information. Thriller/Suspense—generally involve trying to stop some bad thing from happening at the end. Thrillers have broad consequences if the protagonist fails—I.e. the terrorists will launch a nuclear weapon and destroy Washington D.C. Suspense novels have smaller/more intimate consequences. I.e. The serial killer will keep butchering young blonde co-eds. It is easy to see how thriller, suspense and mystery are kissing cousins and keep company. The key here is that there is a ticking clock and some disastrous event will happen if the protagonist fails. So when plotting, all actions are geared to prevention of the horrible thing at the end. Thrillers can run 90-100,000 words (loosely) and sometimes a little longer. Why? Because some thrillers need to do world-building. Most of us have never been on a nuclear sub, so Tom Clancy had to recreate it for us in The Hunt for Red October (Clancy invented a sub-class of thriller known as the techno-thriller). Pick up the pacing and you can have a Mystery-Suspense. Think Silence of the Lambs. A murder happens at the beginning, and the goal is to uncover the identity of the serial killer Buffalo Bill (mystery), but what makes this mystery-suspense is the presence of a ticking clock. Not only is the body count rising the longer Buffalo Bill remains free, but a senator’s daughter is next on Bill’s butcher block. When plotting, there will often be a crime (murder) at the beginning, but the plot involves a rising “body count” and a perpetrator who must be stopped before an even bigger crime can occur (Big Boss Battle). These stories are plot-driven. Characters often do not have enough down-time to make sweeping inner arc changes like in a literary piece. Pick up the pacing and raise the stakes and you have a Mystery-Thriller. Think Killing Floor by Lee Childs. The book begins with a murder of two unidentified people at a warehouse, but if the killers are not found, what the killers are trying to cover up will have global consequences. And I am not telling you what those consequences are b/c it would ruin the book :D.
When plotting, again, there is often a crime at the beginning with rising stakes, and the protagonist must stop a world-changing event from happening (Big Boss Battle). The focus of your plot will be solving the mystery and stopping the bad guy. For more information on this genre, consult the International Thriller Writers site. Romance—Guy and girl have to end up together in the end is the only point I will make on this. Romance is all about making the reader believe that love is good and grand and still exists in this crazy world. The hero cannot be your main antagonist. Romance, however, is very complex and I cannot do it justice in this short blurb. If you desire to write romance, I highly recommend you go to the Romance Writers of America site for more information and that you join a chapter near you immediately. This is one of the most amazing writing organizations around and a great investment in a successful romance-writing career. Word count will depend on the type of romance you desire to write. Again, look to RWA for guidance. Literary Fiction-is character driven. The importance is placed on the inner change, and the plot is the mechanism for driving that change. Literary fiction has more emphasis on prose, symbol and motif. The events that happen must drive an inner transformation. Pulitzer Prize-winning book, The Road is a good example. The world has been destroyed and only a few humans have survived. The question isn’t as much whether the man and the boy will survive as much as it is about how they will survive. Will they endure with their humanity in tact? Or will they resort to being animals? Thus, the goal in The Road is less about boy and man completing their journey to the ocean, and more about how they make it. Can they carry the torch of humanity? When plotting for the literary fiction, one needs to consider plot-points for the inner changes occurring. There need to be cross-roads of choice. One choice ends the story. The character failed to change. The other path leads closer to the end. The darkest moment is when that character faces that inner weakness at its strongest, yet triumphs. For instance, in The Road, there are multiple times the man and boy face literally starving to death. Will they resort to cannibalism as many other have? Or will they press on and hope? Word count can vary, but you should be safe with 60-85,000 words (The Road was technically a novella). Fantasy and Science Fiction will involve some degree of world-building and extraordinary events, creatures, locations. In plotting, world-building is an essential additional step. How much world-building is necessary will depend on what sub-class of fantasy or sci-fi you’re writing. Word count will also be affected. The more world-building, the longer your book will be. Some books, especially in high-fantasy can run as long as 150,000 words and are often serialized. Consult the Science Fiction and Fantasy Writers of America for more information. Horror—This is another genre that breaks down into many sub-classifications and runs the gambit. It can be as simple as a basic Monster in the House story where the protagonist’s main goal is SERE-Survive Evade, Rescue, and Escape. The protag has only one goal…survive. These books tend to be on the shorter side, roughly 60,000 words. Horror, however can blend with fantasy and require all kinds of complex world-building. Clive Barker’s Hellraiser is a good example. Stephen King’s horror often relies heavily on the psychological and there is weighty focus on an inner change/arc. For instance, The Shining chronicles Jack’s descent into madness and how his family deals with his change and ultimately tries to escape the very literal Monster in the House. Horror will most always involve a Monster in the House scenario. It is just that the definitions of “monster” and “house” are mutable. Word count is contingent upon what type of horror you are writing. Again, I recommend you consult the experts, so here is a link to the Horror Writers Association. The Dark Fiction Guild seemed to have a lot of helpful/fascinating links, so you might want to check them out too. Picking a genre is actually quite liberating. Each genre has unique guideposts and expectations, and, once you gain a clear view of these, then plotting becomes far easier and much faster. You will understand the critical elements that must be in place—ticking clock, inner arc, world-building—before you begin. This will save loads of time not only in writing, but in revision. Think of the romance author who makes her hero the main antagonist (BBT). She will try to query, and, since she didn’t know the rules of her genre, will end up having to totally rewrite/trash her story. Eventually, once you grow in your craft, you will be able to break rules and conventions. But, to break the rules we have to understand them first. I have done my best to give you guys a general overview of the most popular genres and links to know more. If you have some resources or links that you’d like to add, please put them in the comments section. Also, for the sake of brevity, I didn’t address other genres, like YA or Western. If you have questions or advice, fire away! Any corrections? Additions? Questions? Concerns? Comments? I love hearing from you. What is the biggest hurdle you have to choosing a genre? Do you love your genre? Why? Any advice? Make sure you tune in for Wednesday’s blog where I continue walking you through blogging for platform :D. What do we blog about to gain a fan base? Give yourself the gift of success for the coming year. My best-selling book We Are Not Alone–The Writers Guide to Social Media is recommended by literary agents and endorsed by NY Times best-selling authors. My method is free, fast, simple and leaves time to write more books! Enter to win a FREE copy. Check out Author Susan Bischoff’s blog. Writing confereces offer tremendous opportunity. Get published. Meet agents. Socialize with other members of your profession. But are you getting your money’s worth? Here are some tips to help you get the most of your writing conference investment. This week is an amazing time for me. I am on the downhill run, careening toward this year’s DFW Writers Workshop Conference in Grapevine, TX. Now, first of all, I gotta say that there is no better conference to go to. And I might be a teensy-weensy bit partial because I am teaching there, but it is true. The DFW Writers Workshop is made up of some of the most passionate, professional creative people I have ever known, and I am deeply humbled to keep such company. Some of you reading this may be going to this weekend’s conference. It sold out months ago. So, if you didn’t get in for this year’s conference, I strongly encourage you to go to the DFWWW website right away. We have an unbelievable keynote next year. I don’t know if I am allowed to say who it is yet, but I will give a little hint—58 NY Times best-sellers. So go sign up…NOW! Before it sells out just like 2010 conference did…only faster. But aside from offering amazing keynotes like Candace Havens, Bob Mayer, and this year’s Jodi Thomas, the DFWWW Conference offers a tremendous variety of breakout sessions designed to make us—writers—the best we can be. Today, I am going to give tips for maximizing your time at a conference, whether you are attending this weekend’s DFWWW Conference or another. Face it, most conferences cost a pretty penny and many of us have to scrape and scrounge and sacrifice to pay our way. If we happen to be traveling to a conference then add even more costs for car rental, gas, plane fare, hotels, food, and on and on and on. This investment can easily run into the hundreds of dollars, and, if you are plan on attending the big RWA or ITW conferences, that price tag can easily soar into the thousands of dollars. Ack! Hey, no worries. It is an investment. Often a BIG investment. Time to get the most out of it. Agents and editors are allies, not gods. Yeah, sorry if I offended any agents or editors out there. We love you and need you and are so grateful you are on our side. Most writing conferences, DFWWW included, go out of their way to provide a good selection of agents and editors to help attendees realize their dreams of publication success. Yet, time and again I see writers, especially new writers, walk around in a dazed panic, eyes dilated and skin pasty, totally scope-locked on the pitch session. Maximize the time you have. Yes, pitch sessions are great, but they are only part of the conference experience. I recommend that you keep a healthy dose of perspective. Agents and editors need you just as much as you need them, probably more. Writers can get published without an agent, but agents (and editors) HAVE to have an author’s work to sell or they are on the breadline. Agents and editors are human. GASP! Yep, their secret is out. They want and need good writing. Plain and simple. That is how they get PAID. Agents go to conferences because it is in their interests (just like you) to do so. Pitch sessions aren’t sudden death overtime. Agents know you are nervous and just as likely to throw up on your shoes as you are to be witty and charming…so relax. They will either see something in your idea, or they won’t. Ultimately, all depends on whether or not they like and believe they can sell your writing. Breathe, smile, enjoy and move on. Any professionally run conference will also offer a selection of classes to hone our skills as writers. Pitching to agents is great, but also make sure you take time to learn about plot, characterization, marketing, pitching, busting past writer’s block, etc. I have to say that DFWWW really shines when it comes to author training. One can count on published professionals like Candace Havens, Rosemary Clements-Moore, A. Lee Martinez and more to give top-notch presentations designed to make you the best you can be. This might seem like a no-brainer, but I see far too many writers only taking advantage of a fraction of what they paid for. Two years ago I attended a conference in Oklahoma. I was deeply disappointed at the behavior of some my fellow writers. Unless there was a session with an agent or editor, these individuals holed up in their hotel rooms (I might also mention that these were the same people who all could have used insight into fundamentals of the craft, such as plot, characterization, etc. Cuz, well, all of us can always learn more). And when they walked away without so much as one request for a query, they believed they’d spend $400 for nothing. Well, in a way, they had. Writers packed in rooms like sardines to listen to agents who looked all of 22 and still had that “shiny new agent smell,” but failed to attend the craft classes taught by a NY Times best-selling author. Not that the agents didn’t have some great nuggets of information, but what might have been a better use of time? An hour with a girl who’d just fallen out of college and who’d been a NY agent all of a minute? Or a seasoned author with over 25 years in the publishing business and an impressive resume of best-selling novels? Most of us gut through day jobs and beg and barter with family to leave us alone so we can write. We know rejection, deeply and profoundly. We are artists who suffer for our craft. But, hey, no one said we had to suffer alone. Meet other writers. Make friends who know your plight and can share your burden. Network with published authors, editors, agents (even the ones who don’t have you scheduled for an official pitch session). Agents change agencies. Editors change publishing houses. One day they may not give a whit about vampires or starships or women’s fiction, but who knows? What will they want in three years or five? These individuals will be far easier to approach if you’ve already established a modicum of rapport. Friendships and acquaintances can open all sorts of doors. We as humans tend to defer to those we know, before we defer to a stranger. Just because we are writers doesn’t mean we do ALL kinds of writing. I got my start as a technical writer, but have gotten to the point that I prefer to take on other more creative assignments. So if a company calls me for a job and I can’t take it, guess who I call? Other writers I know who do that sort of writing. Whether it is opportunities to speak, present, teach, write, review, whatever, networking is key. Also, odds are, you are not the greatest writer the world has ever known with zero room for any improvement (even if your mother thinks you are). Surround yourself by those who are better than you and you will be surprised how much you grow. 1) Agents are on your side. They need you, so calm down. 2) Take advantage of classes to hone your skills in the craft and the business of writing. You paid for them! 3) Be social. Network, network, network. Writing conferences are like summer camp. You might be surprised the friendships you will make…friendships that will not be delivered to your hotel room with the triple-decker sundae you ordered because you passed out at your pitch session. Relax and enjoy! Squeeze every cent of joy and growth out of the conference. And if you are going to be at DFWWW’s conference this weekend, say hello and come to my classes.